The shears have been specially designed to cut through harder (woody) stems as in the cuttings, harvesting, and thinning of vegetables, and fruit. 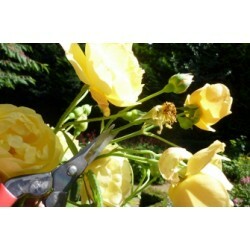 Very light floral scissors for cutting / trimming flowers & herbs and deadheading. The pointed, extremely thin blades ensure that you can reach even the tightest spaces, such as thinning of grapes, pears, or apples, Okatsune thinning shears are the undisputed number 1 in Japan. The Okatsune 306 are professional thinning shears with rounded tip specially designed for cutting ve.. The Okatsune 307 are very light and razor-sharp thinning shears with short blade (1 cm shorter than ..